Ever since the discovery of the Higgs Boson in 2012, the Large Hadron Collider has been dedicated to searching for the existence of physics that go beyond the Standard Model. To this end, the Large Hadron Collider beauty experiment (LHCb) was established in 1995, specifically for the purpose of exploring what happened after the Big Bang that allowed matter to survive and create the Universe as we know it. Since that time, the LHCb has been doing some rather amazing things. This includes discovering five new particles, uncovering evidence of a new manifestation of matter-antimatter asymmetry, and (most recently) discovering unusual results when monitoring beta decay. These findings, which CERN announced in a recent press release, could be an indication of new physics that are not part of the Standard Model. In this latest study, the LHCb collaboration team noted how the decay of B0 mesons resulted in the production of an excited kaon and a pair of electrons or muons. Muons, for the record, are subatomic particles that are 200 times more massive than electrons, but whose interactions are believed to be the same as those of electrons (as far as the Standard Model is concerned). This is what is known as “lepton universality”, which not only predicts that electrons and muons behave the same, but should be produced with the same probability – with some constraints arising from their differences in mass. However, in testing the decay of B0 mesons, the team found that the decay process produced muons with less frequency. These results were collected during Run 1 of the LHC, which ran from 2009 to 2013. The results of these decay tests were presented on Tuesday, April 18th, at a CERN seminar, where members of the LHCb collaboration team shared their latest findings. As they indicated during the course of the seminar, these findings are significant in that they appear to confirm results obtained by the LHCb team during previous decay studies. This is certainly exciting news, as it hints at the possibility that new physics are being observed. With the confirmation of the Standard Model (made possible with the discovery of the Higgs boson in 2012), investigating theories that go beyond this (i.e. Supersymmetry) has been a major goal of the LHC. And with its upgrades completed in 2015, it has been one of the chief aims of Run 2 (which will last until 2018). Naturally, the LHCb team indicated that further studies will be needed before any conclusions can be drawn. For one, the discrepancy they noted between the creation of muons and electrons carries a low probability value (aka. p-value) of between 2.2. to 2.5 sigma. To put that in perspective, the first detection of the Higgs Boson occurred at a level of 5 sigma. In addition, these results are inconsistent with previous measurements which indicated that there is indeed symmetry between electrons and muons. As a result, more decay tests will have to be conducted and more data collected before the LHCb collaboration team can say definitively whether this was a sign of new particles, or merely a statistical fluctuation in their data. The results of this study will be soon released in a LHCb research paper. And for more information, check out the PDF version of the seminar. 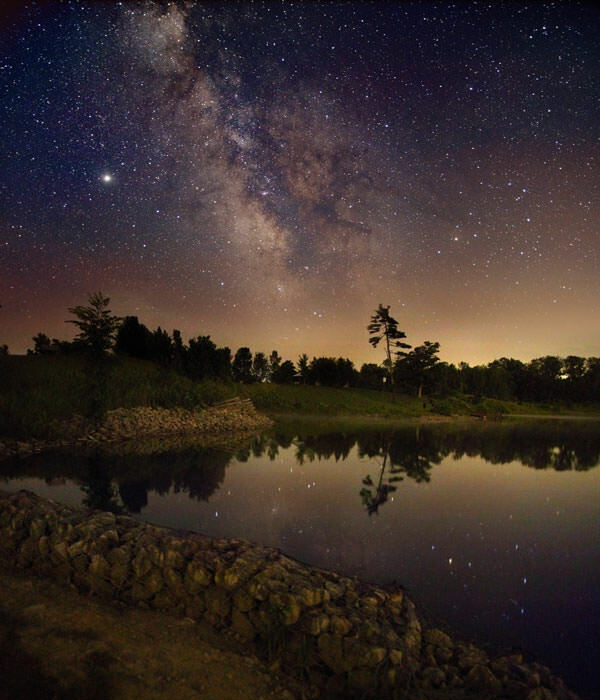 This week, millions of people will turn their eyes to the skies in anticipation of the 2015 Perseid meteor shower. But what happens on less eventful nights, when we find ourselves gazing upward simply to admire the deep, dark, star-spangled sky? Far away from the glow of civilization, we humans can survey thousands of tiny pinpricks of light. But how? Where does that light come from? How does it make its way to us? And how do our brains sort all that incoming energy into such a profoundly breathtaking sight? Our story begins lightyears away, deep in the heart of a sun-like star, where gravity’s immense inward pressure keeps temperatures high and atoms disassembled. Free protons hurtle around the core, occasionally attaining the blistering energies necessary to overcome their electromagnetic repulsion, collide, and stick together in pairs of two. So-called diprotons are unstable and tend to disband as quickly as they arise. And if it weren’t for the subatomic antics of the weak nuclear force, this would be the end of the line: no fusion, no starlight, no us. However, on very rare occasions, a process called beta decay transforms one proton in the pair into a neutron. This new partnership forms what is known as deuterium, or heavy hydrogen, and opens the door to further nuclear fusion reactions. Indeed, once deuterium enters the mix, particle pileups happen far more frequently. A free proton slams into deuterium, creating helium-3. Additional impacts build upon one another to forge helium-4 and heavier elements like oxygen and carbon. Such collisions do more than just build up more massive atoms; in fact, every impact listed above releases an enormous amount of energy in the form of gamma rays. These high-energy photons streak outward, providing thermonuclear pressure that counterbalances the star’s gravity. Tens or even hundreds of thousands of years later, battered, bruised, and energetically squelched from fighting their way through a sun-sized blizzard of other particles, they emerge from the star’s surface as visible, ultraviolet, and infrared light. But this is only half the story. The light then has to stream across vast reaches of space in order to reach the Earth – a process that, provided the star of origin is in our own galaxy, can take anywhere from 4.2 years to many thousands of years! At least… from your perspective. Since photons are massless, they don’t experience any time at all! And even after eluding what, for any other massive entity in the Universe, would be downright interminable flight times, conditions still must align so that you can see even one twinkle of the light from a faraway star. That is, it must be dark, and you must be looking up. The incoming stream of photons then makes its way through your cornea and lens and onto your retina, a highly vascular layer of tissue that lines the back of the eye. There, each tiny packet of light impinges upon one of two types of photoreceptor cell: a rod, or a cone. Most photons detected under the low-light conditions of stargazing will activate rod cells. These cells are so light-sensitive that, in dark enough conditions, they can be excited by a single photon! Rods cannot detect color, but are far more abundant than cones and are found all across the retina, including around the periphery. The less numerous, more color-hungry cone cells are densely concentrated at the center of the retina, in a region called the fovea (this explains why dim stars that are visible in your side vision suddenly seem to disappear when you attempt to look at them straight-on). Despite their relative insensitivity, cone cells can be activated by very bright starlight, enabling you to perceive stars like Vega as blue and Betelgeuse as red. So the next time you go outside in the darker hours, take a moment to appreciate the great lengths it takes for just a single twinkle of light to travel from a series of nuclear reactions in the bustling center of a distant star, across the vastness of space and time, through your body’s electrochemical pathways, and into your conscious mind. It gives every last one of those corny love songs new meaning, doesn’t it? Beta radiation is radiation due to beta particles, which are electrons (or, sometimes, positrons); mostly, when you come across the words ‘beta radiation’, what is meant is what is produced by beta decay (radioactive decay which produces beta particles … either electrons or positrons). Within a few years of Becquerel’s discovery of radioactivity (in 1896), its heterogeneous nature was discovered … and the three (then) known components given the memorable names alpha radiation, beta radiation, and gamma radiation. And, in 1900, Becquerel showed that beta radiation was composed of particles which have the same charge-to-mass ratio as electrons (which had been discovered only a few years’ earlier). The realization – by Irène and Frédéric Joliot-Curie, in 1934 – that some beta radiation is composed of positrons, rather than electrons, had to wait until positrons themselves were discovered (in 1932). * the key to the specifics of beta decay is the emission of a neutrino (or antineutrino), postulated by Pauli (in 1931) and combined into a model by Fermi, in 1934 (though it wasn’t until 1956 that the neutrino was detected, and the 1960s for the existence of carriers of the weak force – the three bosons W–, W+, and Z0 – to be hypothesized). * beta radiation has the characteristics we observe it to have because key constants in the weak interaction have the values they have (no theory in physics predicts what those values are … yet); had those values been just a teensy bit different in the early universe, we would not be here today (this is part of an idea called the anthropic principle). Here are some of the Universe Today stories that are related to beta radiation New Insights on Magnetars, Superstrings Could Be Detectable As They Decay, and Don’t ‘Supermassive’ Me: Black Holes Regulate Their Own Mass. Two Astronomy Cast episodes are well worth a listen, as they provide further insights into beta radiation The Strong and Weak Nuclear Forces, and Nucleosynthesis: Elements from Stars. Beta decay is when an unstable atomic nucleus decays (radioactively) by emitting a beta particle; when the beta particle is an electron, it is β– decay, and when a positron, β+ decay. Beta rays, as a distinct component of the rays given off in radioactivity, were discovered by Rutherford, in 1899, just a few years after radioactivity itself was discovered (in 1896). However, this is beta minus decay … the discovery of beta plus decay (by Irène and Frédéric Joliot-Curie, in 1934) came after the discovery of the positron (in cosmic rays, in 1932) and the (then) controversial ‘invention’ of the neutrino (by Pauli, in 1931) to account for the continuous energy spectrum of electrons in beta decay. It was also in 1934 that Fermi published – in Italian and German (Nature considered the idea too speculative!!) – his theory of beta decay (for more details on this, check out this Hyperphysics page). In beta minus decay, a neutron changes into a proton, antineutrino, and electron; this conversion is due to the weak interaction (or weak force) … a down quark (in the neutron) becomes an up quark and emits a W– boson (one of three bosons which mediate the weak interaction), which then decays into an electron and an antineutrino. Beta plus decay – which is also known as inverse beta decay – involves the conversion of a proton to a neutron, positron, and neutrino. So why do isolated neutrons decay (but those in stable nuclei, and those in neutron stars, don’t)? And why are isolated protons stable, but those in certain radioactive nuclei not? It’s all down to energy … if one state (an isolated neutron, say) has a higher energy than another (proton plus electron plus antineutrino), then the first will decay into the second (the baryon number of the two states must be the same, ditto lepton number, and so on). There is also a rare double beta decay, in which two beta particles are emitted; it has been observed, in some unstable isotopes, as predicted. There is one kind of double beta decay – called neutrino-less double beta decay (the image above is from the COBRA Project, one study of this) – which is being studied intensely (though no such decay has yet been observed), because it may be one of the very few easily opened windows into physics beyond the Standard Model (see this WIPP page for more details). Berkeley Lab has a neat Guide to the Nuclear Wallchart (subtitled “You don’t need to be a Nuclear Physicist to understand Nuclear Science“!) on beta decay, and this Ohio University page – Alpha and beta decay – puts more technical meat on the bare overview bones. Pushing the Polite Boundaries of Science About Dark Matter is a Universe Today story which has a tangential reference to beta decay (it’s in the comments!). Are there relevant Astronomy Cast episodes? Sure! Nucleosynthesis: Elements from Stars, The Strong and Weak Nuclear Forces, and Antimatter.